I can't believe how fast February is disappearing! It's our third week at CASE Study with Karola Witczak as our lovely muse already! 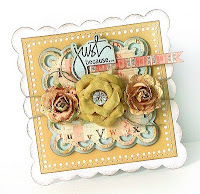 Here's Karola's beautiful card this week. 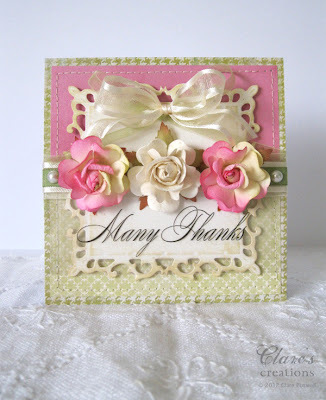 I CASEd the layout, the trio of flowers as the focal point and the square format of Karola's card. For the fancy square I used Spellbinders Fleur de Lis Square Dies and inked the edges with Distress Ink. The sticker sentiment is from Fancy Sticker Sentiment - Thanks by SRM Stickers and I layered it onto some acetate. 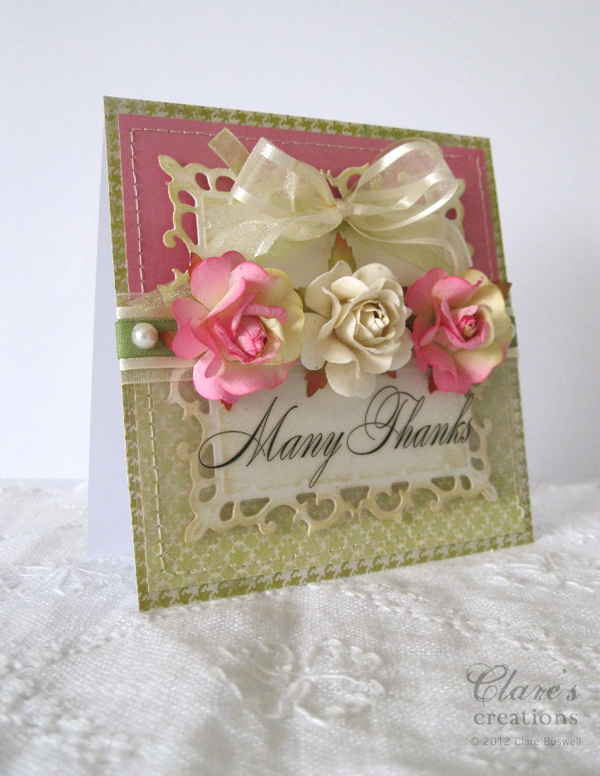 The Soft White Roses and the Two Tone Pink Roses are both from the Craft Fairy. The patterned papers are from Vanity Fair 6x6 Paper Pad by My Mind's Eye. The gorgeous Ivory Satin Edged Ribbon and Green Chiffon Ribbon are both from the Craft Fairy. 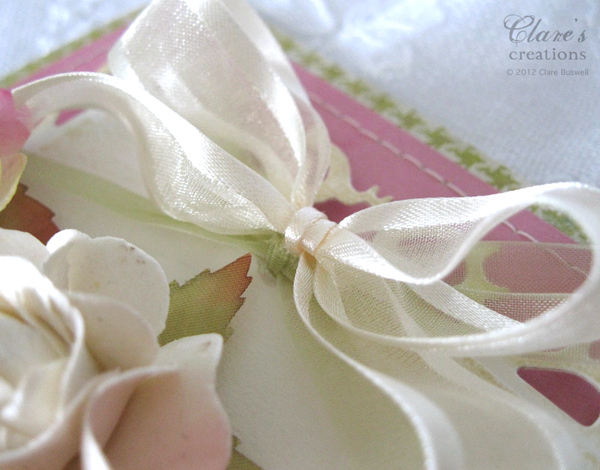 I layered some Ivory Chiffon Ribbon with the Ivory Satin Edged Ribbon and Willow Green Twill Ribbon across the middle of the card. This week at CASE Study we're sponsored by My Thoughts Exactly and there's a great prize up for grabs. Don't forget to pop by the CASE Study blog this week and play along if you have time. Check out the fab creations from the rest of the DT. WOW, Clare, this is utterly STUNNING! LOVE the inspiration you took from the Muse card. LOVE the GORGEOUS colours, the BEAUTIFUL flowers, and that LUSCIOUS bow! Gorgeous Clare and very elegant! Oh those flowers are just gorgeous Clare!! Your interpretation of the card is so gorgeous! Love it! 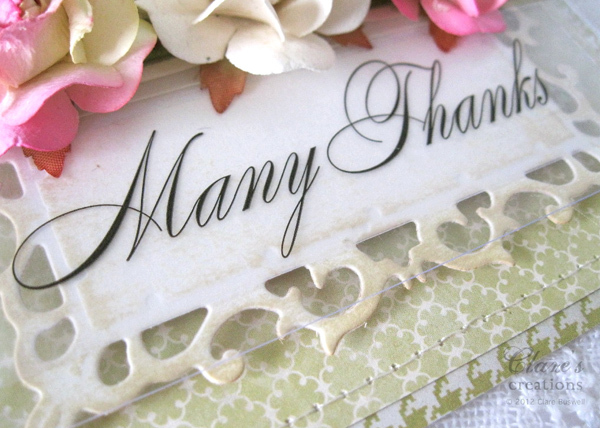 Beautiful card - I like the way you applied the elegant sticker to acetate, and embellished with the darling flowers! Such a feminine card! Thanks for sharing the acetate tip! Wow, this is beautiful. I love everything about it, especially the colours and the diecut frame you have used to layer up. Again wow!! Gorgeous card Clare, as always! CASE Study #79 - Make a Wish! CASE Study #77 - Hello Friend!